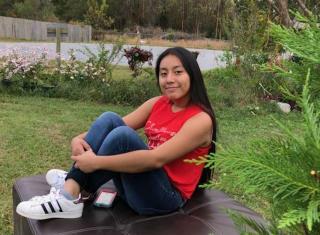 (Newser) – The father of a North Carolina teen who was abducted from outside her Lumberton home on Nov. 5 and whose body was found after a three-week search has been blocked from attending her Saturday funeral. Noé Aguilar—the Guatemalan father of 13-year-old Hania Aguilar—was immediately denied a temporary visa by the State Department when he visited the US Embassy in Guatemala City on Monday. Officials called out his lack of strong ties to his native country and low bank balance, which they say raised the risk that he wouldn't return, his Texas-based lawyer, Naimeh Salem, tells the New York Times. Aguilar, who previously lived in the US but returned to Guatemala in 2005, "has never attempted to come back to the US," says Salem. "He wanted to kiss his daughter goodbye." We need to dig a deeper part of Hell for Trumpists. All part of the new reality, under Trump. The State Department has probably issued instructions to its ambassadors and its consular officers, to deny as many visa applications as possible, regardless of circumstances. Fortress America, withering on the vine. My wife and I are US citizens, expats but we can't get a visitor's visa for our adopted daughter because they say she doesn't have enough ties to Mexico. They say we would keep her illegally in the USA. We don't live in the USA. If we did we'd apply for an immigrant visa but we can't do that because we don't live there. They don't allow appeals.